It’s almost midnight on Christmas Eve. The flurry of preparations has come to a halt (for now) and almost nothing is stirring. I’ve been so busy that I’ve not had the chance to make a special holiday post. Here in bayou country, we do things a little differently. 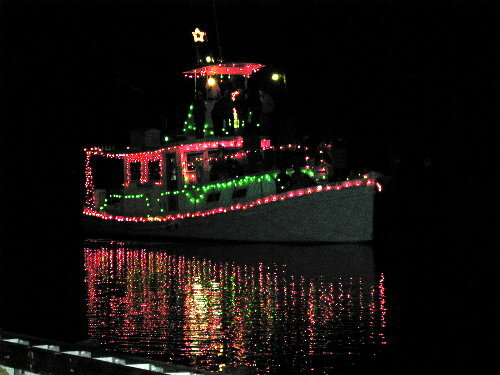 Santa rides a boat, and the boat parades are beautiful. Most of the boats that participate in the parades are shrimp boats, and here’s what they look like. Four of my 5 children and two of their significant others are in the den watching a comedy DVD together. I am letting the youngest 2 stay up late to increase the chances of their sleeping later in the morning. No matter what you believe about Christmas, I hope you took advantage of the time off from work to be with your loved ones, to remember one less fortunate than yourself, and to share a smile, if nothing else. I wish peace upon your homes, and to all a Good night!! May peace and happiness be yours this Christmas time and may much love and kindness flow through you & your families in this new year. Deb, thanks so much for the blessing!